Swizzler, a food truck that frequents H Street, will be featured at a Foggy Bottom pop-up space. 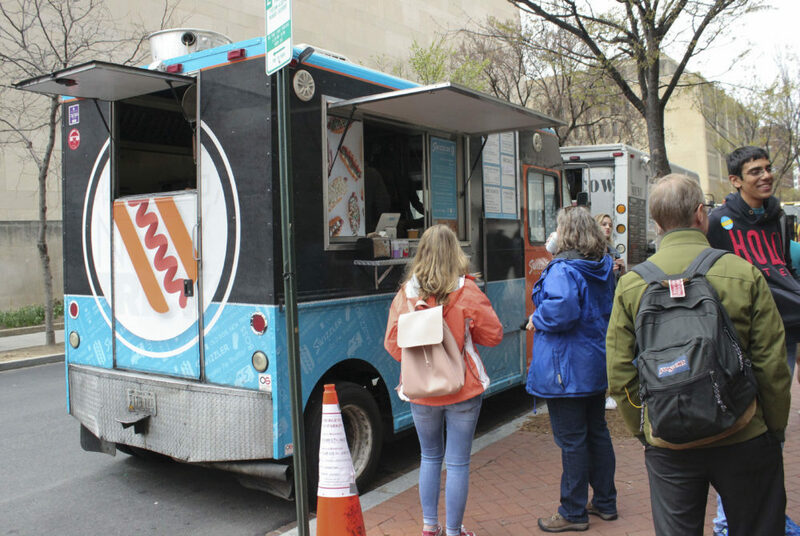 Swizzler, a food truck known for spiral-cut hot dogs, will be the first to fill a new pop-up space in Foggy Bottom. Prequel, a restaurant incubator that hosts pop-up restaurants, is opening a location at 919 19th St. NW Tuesday with Swizzler as the first tenant, according to The Washington City Paper. The space is the former location of Cities Restaurant & Lounge, which moved to K Street in 2015, and sits just two blocks from campus. The pop-up’s menu adds cheeseburgers and fried chicken sandwiches to their selection of famous corkscrew hotdogs in flavors like the Leonardo Dog Vinci, a spin-off on a caprese salad, according to Prequel’s website. A traditional caesar salad will be offered as a side dish and a time-honored milk and cookie combination is the sole option for dessert. The burger comes in a double stack ($10.95) or a triple stack ($13.95), the patty is sandwiched between two golden brioche buns from Lyon Bakery. The burger is topped with Cabot cheddar cheese and slathered with Swizzler’s gigi sauzz, which is a “tricked out Dijonaise” sauce. The Fried Chicken Sando ($9.95) is topped with cole slaw, candied jalapenos and gigi sauzz on a toasted brioche bun. Jesse Konig, Ben Johnson and Jack Zimmermann, the entrepreneurs behind Swizzler, told Washington City Paper that their latest goal is to open a stand in Nationals Park before opening day in spring 2018. Prequel will be open Monday through Wednesday from 4 to 10 p.m. and Thursday through Saturday until 11 p.m. Swizzler’s last day at Prequel has not been announced but the food incubator will host “rotating pop-ups,” according to their website. Prequel will also feature a menu of cocktails that range from classics like bellinis, wine and beer to “Burnin’ Down the House” ($13), a cocktail that mixes Scotch, Banana Peppers, Honey and Lemon.